I recently started using Apple Music to snag a lot of music in hopes of mixing with. However, Traktor doesn’t seem to recognize any track I have downloaded via Apple Music. Did they restrict this or is there something specific I need to do to access these track? Thanks in advanced. Music streaming has grown up tremendously since its inception and seems to be taking over traditional .mp3 file downloading as the best way to listen to music. Streaming services let you pay a small fee each month, or even get the music for free if you can put up with advertising (Spotify & Deezer), and get access to huge music libraries to listen to whenever and wherever you fancy. Most of music streaming services adopt DRM technology to protect their music form being copied and enjoyed without authorization, which has helped curb the need for piracy, but also limits user's usage of these songs. In other words, due to the DRM protection, the ownership of the actual file is being removed from the end user, back to the music industry. There is no denying that Apple Music service is also a member among them. All music streams from Apple Music are encoded in protected M4P format due to which you are not allowed to import the songs and tracks you downloaded from Apple Music to other unsupported devices and platforms for using, including Traktor DJ software. In this case, to play Apple Music on Traktor, you need remove DRM from Apple Music to get the full ownership. NoteBurner Apple Music Converter is a smart yet easy-to-use Apple Music DRM removal tool for Apple Music users, which is specially developed to strip DRM restriction from Apple Music streams while converting the locked songs from M4P to MP3, FLAC, AAC or WAV format at 10X speed. Besides, it is capable of downloading Apple Music tracks without damaging the original streaming audio quality. With the help of this powerful tool, you can easily copy and transfer the downloaded Apple Music songs to any media device, including Traktor DJ program, portable MP3 player and so on. 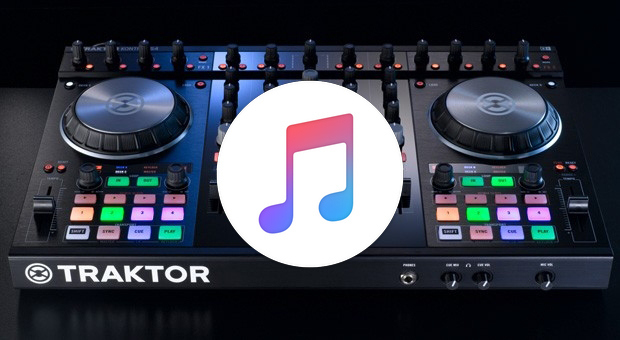 The following is the detailed tutorial to guide you to remove DRM from Apple Music songs and import to Traktor DJ. Please download NoteBurner Apple Music Converter first before getting started. After completing the above steps, the final one is clicking the button "Convert". Just a few second, it will succeed. Once the conversion finishes, the DRM will be removed completely from Apple Music tracks, and you can import them to Traktor DJ. Launch Traktor DJ software, click on Setting button >> File Management, then you will see a pop-up window. On it, please check the box that says "Import Music-Floders at Startup", then find the part of Music Folders, and click the Add button to navigate your computer and find your music. Once you have located your music, please close the window, and click on the "Track Collection" >> "Import Music Folders" to import your music. After few minutes, the converted Apple Music will be added to Traktor DJ successfully, and you can use them on Traktor DJ without any limits. For more details, please follow: How to Import Music into TRAKTOR's Track Collection.